Learning some basic golf rules is a necessity for any new golfer. As if learning how to golf wasn't difficult enough, you also need to learn the rules in order to properly play the game and to avoid any tense situations on the golf course! I've seen a number a heated conversations on the course regarding specific rules! Where to take a drop? How many penalty strokes should you take? These are just a few of the basic golf rules that you need to familiarize yourself with. If you are looking for a comprehensive list of not only basic rules, but also some of the more obscure ones, please look into purchasing the official PGA rule book or similar publication. Please see the bottom of the page for more details. This page will only focus on the main rules. -You can carry no more than 14 clubs in your bag. -Most courses will require you to make a tee time ahead of time. Make sure you get to the course early because they may scratch you from the list if you are late. -Each course will have its own rules regarding where and where not to drive the golf cart. Please adhere to these rules! -Tee your ball anywhere in between the tee markers but no more than two club lengths behind the tee markers. Never tee off in front of the markers. -If your ball falls off the tee, you are re-tee without penalty. -After the first hole, "honors" comes into effect, meaning that the person with the lowest score on the previous hole tees off first. Subsequent golfers tee off following the same order. -If you swing and miss after addressing the ball, it counts as one stroke. -Any contact with the ball after address counts as one stroke. -You may remove loose impediments around your ball (branches, leaves, etc. ), but you may not remove anything naturally growing. -If the ball is deemed unplayable, take a one stroke penalty with a drop within two club lengths of the original spot, but no closer to the hole. -A ball is lost if it is not found within five minutes of looking for it. -If your ball is deemed lost, you will take a two stroke penalty and either take a provisional shot (from the same location prior to looking for your ball), or you will have to return to the original location after looking. If you play a second ball, but eventually find the first one, you must keep playing the second ball. A one stroke penalty means if your first shot is lost, the next shot that you take will be your third. -You do not need to take a penalty if your ball is up against a man made obstruction like a bench, or if is in ground under repair, a hole, or casual water (large puddle). -If your ball is in a sand trap, you may not touch with sand with your hands or the club prior to your shot. If you ground your club in the sand at address, it is a two stroke penalty. -If you hit your tee shot into the water you may hit again from the tee with a one stroke penalty, but if the ball is playable from the water, you do not need to take a penalty. -Double Eagle : Three strokes under par. Only applicable on a par 5. -Eagle : Two strokes under par. -Birdie : One stroke under par. -Par : Accepted score for any hole. 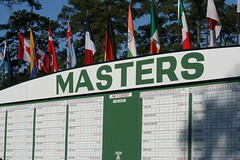 -Bogey: One stoke over par. -Double Bogey : Two strokes over par. -Follow each courses rules for where and where not to drive the golf cart. -Don't talk while another golfer is attempting a shot. -Yell "Fore!" is your shot is traveling towards another person on the course. -When you hit out of the sand trap, please rake your foot prints and impact area. -Once everyone is on the green, either tend the flag for longer distance shots, or pull it if everyone can seen the hole. -Repair all ball marks on the green, and divots. -On the green, do not walk over the path (the "line") of another player's putt. -Let faster players play through. -The golfer furthest from the hole hits first followed by the next furthest and so on.